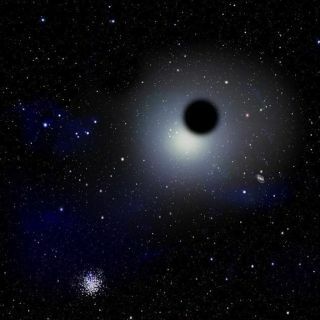 Artist's concept of a "rogue" black hole wandering through space. Hundreds of wandering "rogue" black holes may dwell in the Milky Way — and now researchers say they know how to detect them. Discovering these strange objects could shed light on the formation of the Milky Way and other galaxies. No one knows exactly how the Milky Way came to exist. But according to one popular model of galaxy formation, the building blocks of the Milky Way were dwarf galaxies that collided and merged shortly after the Big Bang. Each of the Milky Way's building-block galaxies had its own central black hole. During mergers between dwarf galaxies, these black holes also came together. In the process, the new single black hole received a rocket-like kick from the emission of excess gravitational waves in the opposite direction, said astrophysicist Avi Loeb of Harvard University, who wrote the paper together with his graduate student Xiawei Wang. Once the host galaxy became massive enough, the black holes near it would have been unable to escape. One of them grew and became the supermassive black hole that is believed to exist at the center of the Milky Way, weighing four million suns. But there should be hundreds of rogue black holes floating in the distant "halo" of the Milky Way, left over from the pre-Milky Way time when only dwarf galaxies existed, Loeb said. "The Milky Way halo serves as a kind of a 'reservoir' of wandering black holes that originally lived in the cores of the small galaxies that merged to make it," he said. But how does one detect them, if it is impossible to observe black holes directly, and they are"rogues" floating somewhere in space? Loeb and Wang say they have founda way. "When such black holes pass through the gas disk of the Milky Way galaxy, they produce a bow shock — similar to the sonic boom produced intheair by supersonic jets," said Loeb. "The shock accelerates electrons to high energies and these emit radio waves that we can detect." "And the radio emission from these bow shocks should be detectable with existing radio observatories," he added. "Of course, if such a bow shock is discovered, one would be able to also observe the cluster of stars attached to the floating black hole and possibly the X-ray emission from the black hole itself as it accretes gas." This method would be"a nice new way to identify the theoretically predicted [wandering black holes]," said astrophysicist Jeremy Darling of the University of Colorado, who did not take part in the study. "The Wang and Loeb paper shows how these black holes can create a bow shock as they pass through the disk of our galaxy, effectively lighting up and making themselves available for observation." And he agrees that in principle, these bow shocks should be "easily detectable with current facilities," using radio and infrared waves. But it won't be easy, cautions Darling, as the difficulty is "the 'needle-in-a-haystack" problem common in astronomy: There are many objects emitting in the radio and infrared range in the disk of our galaxy, and Wang and Loeb predict that only a few black holes (in some scenarios maybe not even a single one) should be in the disk at any given time. During earlier research, Loeb and his former student Ryan O'Leary proposed another way to detect these floating black holes. They suggested that such black holes are likely surrounded by a cluster of stars that were originally tightly bound to them. These clusters would bevery different from globular star clusters, as they would be held together by the gravity of the black hole. As a result, they would be very compact, just a few light-years in size. Loeb and O'Leary have identified candidate star clusters and are currently collecting spectroscopic data on some,to test if any of them has a central black hole. "There may be a treasure trove in the backyard of the Milky Way that could inform us about the first generation of black holes in the universe," Loeb said.